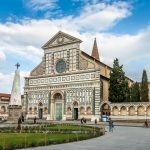 Santa Maria Novella means New St. Mary, that’s because it was built in place of the old church of Santa Maria delle Vigne. The Dominican Order, in Florence since the early 13th century, needed a larger convent, and the project was designed by two friars, Frà Sisto and Frà Ristoro. Construction began in 1279 and the church was completed in the first half of the 14th century, but the facade was left unfinished and completed only in 1470. Today this church is one of the great attractions of Florence. 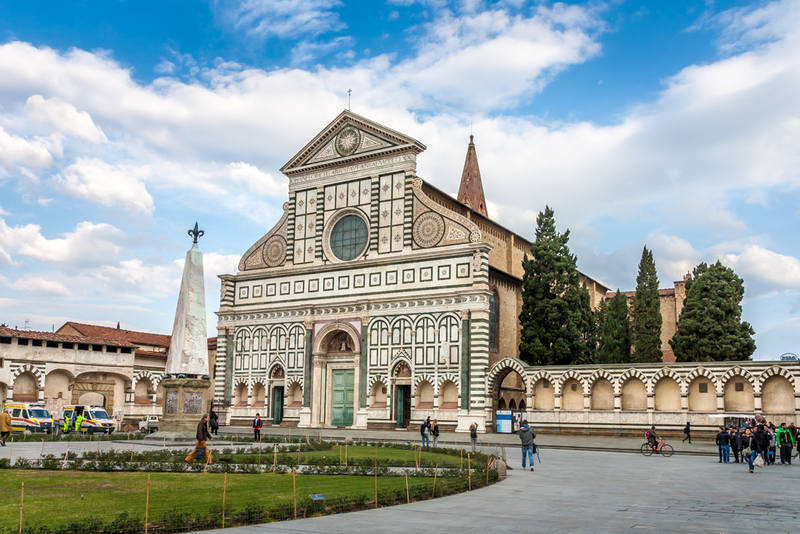 Rich families in Florence Italy had the patronage of chapels inside the church, which were decorated with frescoes or sculptures by the best artists of the Renaissance. Among the artists who worked here, there’s names like Masaccio, Brunelleschi, Botticelli, Ghirlandaio, Filippino Lippi and Bronzino. The magnificent frescoes of the Tornabuoni Chapel, the main chapel right behind the altar, were made by Ghirlandaio with help by his apprentices, one of them being a 13 years old Michelangelo (his very first job). Many more works once in this church now lay in the most important musea of Florence Italy, like the Rucellai Madonna by Duccio di Buoninsegna, now at the Uffizi Gallery. Left unfinished when the church was completed, the facade of Santa Maria Novella was finished by Leon Battista Alberti in 1470, thanks to the generous donation by a rich merchant, Giovanni Rucellai. Alberti had to join up an unfinished gothic facade with something representing the taste of his age, the Renaissance and also had to take into consideration the rose window which was there already. Leon Battista Alberti is the man who coded the rules of the Renaissance is his famous essays: De Pictura (about painting), De Re Aedificatoria (about architecture) and De Statua (about sculpture).